Rakiraki is a district in Fiji’s Ra Province. The town itself is located around 2.5 hours drive from Nadi, about half way between Suva and Nadi when traveling the Kings Road along the northern coast of Viti Levu (Fiji’s largest island). The north coast is less often seen by visitors to Fiji. However, the scenery is beautiful and getting here is an adventure in itself. The area boasts some of Fiji’s best dive sites off the surrounding islands and Vatu-I-Ra Passage in the legendary Bligh Waters. A few kilometres off the Rakiraki coast lies the island of Nananu-I-Ra popular for it’s pretty beaches, excellent snorkeling and diving and windsurfing and kitesurfing possibilities. If you’re looking for a tropical paradise with the convenience of being located on the main island away from the more commercialised areas of Fiji, then Rakiraki is definitely a region to be visited and explored. The Ra Peninsula receives abundant sunshine throughout the year, receiving drier conditions throughout the year due to the nearby Nakauvadra Range. The coast is fringed by the Vatu-i-Ra Passage in the deep water channel known as the Bligh Water (named after Captain Bligh of The Bounty), which separates the two main islands of Fiji - Viti Levu and Vanua Levu. This passage is known for its abundant and diverse marine life. The hilly island of Nananu-i-Ra lies about 1.5 kilometres offshore, and is known for its peaceful bays and white, sandy beaches. Mangroves line the coastline round the peninsula and beyond is a majestic mountain backdrop. Resorts are built into the hillside leading down to the water’s edge. Sugar cane is grown in the valleys whilst cattle graze in the highlands. About 10 km west of Rakiraki near Vitawa Village lies Navatu Rock, a prominent landmark believed to be one of Fiji’s oldest human settlements. There was once a fortified village on top of the rock, and pottery excavated at its base has been dated to around 1000 BC. It was believed that from here spirits would depart for the afterlife. 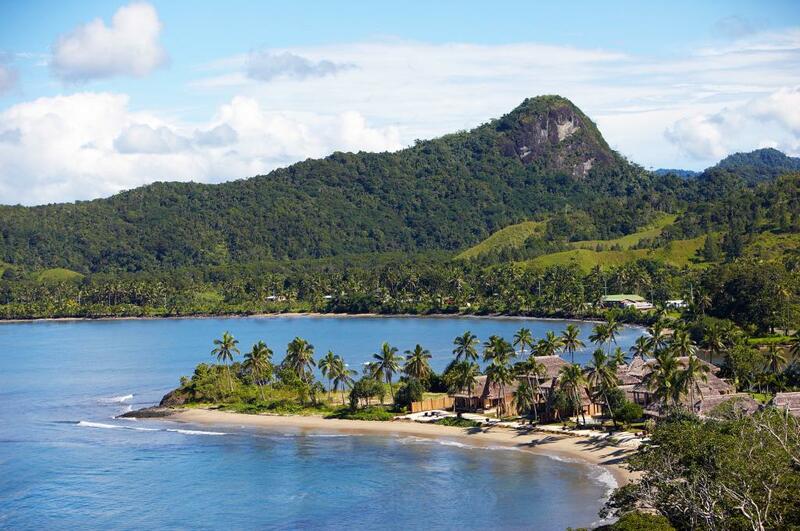 The Rakiraki district is about a 2.5 hour drive from Nadi Airport or Nausori Airport in Suva. The area is good for water activities including kayaking, stand up paddleboarding, snorkelling, scuba diving, game fishing and island boat tours. Windsurfing and kitesurfing is popular on Nananu-I-Ra during the months of April to October due to the consistent trade winds. There are several cultural tours to local villages and the tomb of Fiji’s famous cannibal chief Ratu Udre Udre. You can also experience a traditional kava ceremony and Meke performance. The Vatu-i-Ra Passage and Bligh Water can be dived on a year round basis, however conditions will vary throughout the year. The water is warmest during the summer wet season of November to early April (27˚C - 29˚C). During this time brief, local showers occur and surface conditions are generally at their most calm, but visibility may be a little lower (still up to 25 metres). December to March is typically cyclone season. May to September usually brings excellent visibility of 30+ metres. The water is coolest between July to October when temperatures range between 23˚C - 26˚C. June to October is the windiest period. For windsurfing and kiteboarding the best months are from June to August when the trade winds reach 10 knots or more on most days. The reefs around the most northern point of Viti Levu are less visited but offer some of the most fish life and abundance of colour in all of Fiji. There are more than 50 dive sites in the area, many of which are no more than a 20 minute boat ride from Rakiraki resorts. Land based dive operators now make it possible to dive the renowned Bligh Waters and the more remote offshore reefs (45+ minutes away) which were previously only accessible by dive liveaboard. The reefs in the surrounding Bligh Waters are some of the healthiest in the world and the diving is superb with schools of barracuda, spanish mackerel and trevally frequently sighted roaming the coral heads with resident reef sharks. Black coral trees, multi-coloured hard and soft corals, sea whips and prolific tropical fish make this a photographer’s paradise. A deep reef consisting of three coral heads at 25-30 metres with a drop off to 100 metres where schools of big fish and many sharks are found. The dive will leave you as the name suggests! Again as the name suggests, this dive will have you cruising through a maze of canyons, swim-throughs and channels, their walls lined with vibrant fans, soft corals and coral trees. You will be surrounded by many colourful anthias and fusiliers. Hit this dive site with the right currents and you will be blown away by the profusion of yellow soft corals on this pinnacle dive. A sea of gold anthias, crimson sea fans and blue water add even more colour to this dive. There are two wrecks in the area. Sitting in 20 metres of water, this is Fiji 's largest and most accessible wreck, teaming with marine life. Offers an exhilarating 55 metre dive into a roll-on roll-off car ferry which sunk on 23rd August 2003.